To build a winning team in modern basketball, many specific skills are necessary, a highest quality staff work, recruitment ability, planning, programming and technical and physical management in each session, match and training. 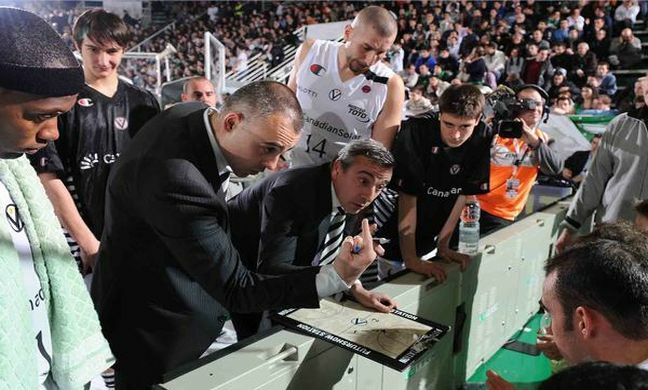 In Europe, teams which participate in the national championships in the Euroleague have the added difficulty of never having taken the possibility to train with heavy workloads and intensity that is sometimes necessary during every game from the regular season. In particular, those who travel with the teams playing every 2 or 3 days does not allow them to always work with an accurate working program. One of the keys to success of a team then becomes the ability of technical staff to provide the right amount of information to be incorporated by the players as well as the ability of the latter to understand the directions provided by the staff as much as possible. I wondered what was the key to generate interest in the team and the answer often got it from the players themselves, especially those who had the capacity to direct the group's work toward optimizing time and among themselves incarnate the improving motivation necessary for a successful program and take charge of teammates, coaches, public and team owners. During the time I spent with Virtus Bologna (Lega A, Italy), I was fortunate to train leaders of the stature of David Moss and Terrell McIntyre. Listening and talking to players with that mental determination, has enabled us to both the technical staff and the same classmates, to raise the level of the objectives of a single session to the level of excellence demanded by the players themselves. McIntyre finished training sessions with a round of 50 free throws to the system +1, -1 (a free throw made worth 1, a missed worth -1). The last 20 must be "nothing but net". I proposed to count -1 those free throws which also not to enter clean. He accepted without hesitation, and during the first session had made 67 consecutive free throws... and still missing 11 clean balls. The determination and desire to finish and succeed, made ? ?all the companions remain hypnotized watching it and the next day, they asked for themselves to do similar things. Similarly, the determination with which Moss took care of the folks who wandered into camp after a video session they had been given a particular technique or tactical decision, the way he did that in the video sessions and staff for the reply on the field, decrease the tolerance level of each error. The overall intensity rose and the possibility of growth increased with comforting continuity. The conclusion of this paper refers to the first of a series of articles on how to build a high-level program. The search for an emotional leader who is at the service of others and to encourage his fellow colleagues to do the same is one of the first steps. And be lucky enough to find them, also helps a high level coach to grow.